The Combat Tactical Vehicle (Technology Demonstrator) was a test bed vehicle built by the Nevada Automotive Test Center (NATC), for the Joint Light Tactical Vehicle’s Combat Tactical Vehicle (CTV), under contract for the Office of Naval Research (ONR). The United States Marine Corps is currently testing and evaluating the vehicle at the NATC proving ground in Nevada for cross country mobility. It also included is ballistic testing of several armour solutions. The vehicle demonstrates several new technologies, such as a fully adjustable front and rear suspension, with 21in wheel travel. The chassis and basic armour are made from aluminium by BAE Systems. The aluminium armour offers high level protection, concentrated throughout the lower hull. A B kit armour package, designed by Plasan, can be fit to protect the higher portions of the cabin. The B kit armour uses a combination of composites and ceramics attached to sockets embedded in the basic vehicle. Blast deflecting structures and seats are used to protect against mine and blast effects. The engine is a 322hp Detroit Diesel/MTU Friedrichshafen 926 turbo-diesel. There is optional rear wheel steering, along with a central tire inflation system and VFI run-flat tires. It is capable of fording water at depth of 30inch’s (60inch’s with preparation). It features electronically controlled braking (ABS) system and electronic stability control (ECS). 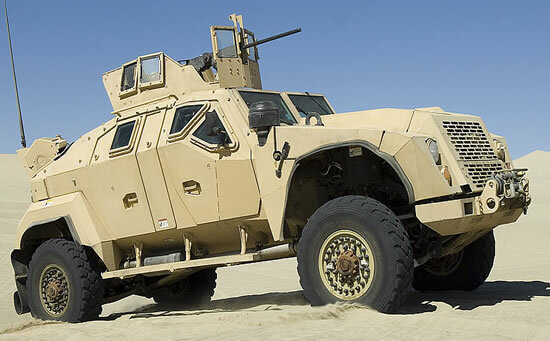 The vehicle is not part of the JLTV program and on 23 August 2012, the Army and Marine Corps selected the Lockheed Martin JLTV, the Oshkosh Defense L-ATV, and the AM General BRV-O as the winners of the Engineering and Manufacturing Development (EMD) phase of the competition.